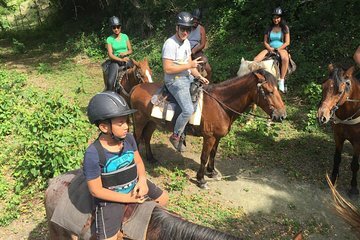 Haal het beste uit je haventijd in Puerto Plata met een prachtige rit paard door het Dominicaanse platteland. Met handige port-pick-up rijd je in het comfort van een bus met airco naar Rancho Los Cacaos en ga je te paard de jungle in. Luister naar verhalen over de oorspronkelijke inwoners van Hispaniola, de Tainos, en geniet van een panoramisch uitzicht op Maimon Bay en Amber Cove vanaf een uitkijkpunt op een heuvel. We arrived on a Carnival Cruise.. first expect to take a walk. You must walk completely out of the complex for the port to the main highway. You may feel lost but this is where they will pick you up. Upon arrival at the ranch the guides showed us many local items that were important to them and very interesting for us to learn about. The horses were all very well behaved and seem happy and healthy. There had been lots of rain so even with lots of mud we had a great time! For the money and time you can not go wrong with this excursion! We will definitely go back! This was the best excursion we have ever taken not even taking into account the great value. We got off the ship and found our driver immediately. Unlike most excursions we take he did have extremely limited English but who cares when he takes you in a timely safe manner to the destination and waited until we were done. I do usually worry a little about the ride back if they will be on time. Our party consisted of kids 9 to 20 and the 2 adults. The place was extremely clean for a ranch and the staff very professional. You could tell they were a little new to it but everything went very smoothly. Only the 20 year old in our party had ever ridden before. Did a great job acclimating us to the horses and they did an excellent job keeping the horses in line. Bonus was they had bug spray which we did not think of. It was a little muddy but that was expected. Horses were well mannered and sure footed. It was a gorgeous ride up the hills to the lookout where the ship was in the distance. The front guide did a great job pointing out the local flora and fauna. He was constantly taking video and pictures with his phone that once back at the corral with the free wifi he had downloaded free to my wifes phone. Fresh local fruit and non alcoholic beverages provided. Cheap beer as well thank God because on the boat and port it is expensive. Great staff. Did I mention great staff. No I do not know these people. I would not hesitate recommending them. Wife says we will go again when we go back.